Daylight Saving Time tends to be a big topic here at The Baby Sleep Site®; we start getting e-mails in the Helpdesk up to a month before it ends, asking for suggestions on how to help babies and toddlers ‘fall back’ and adjust to the time change. And that’s what we are talking about today! In this article, we’ll outline exactly how you can handle the time change, based on your baby or toddler’s temperament and current sleep habits. You may be wondering why we make any fuss at all over the end of daylight saving time. It happens every year, after all…what’s the big deal? The big deal is this: your baby’s internal clock won’t change along with your household clocks. And while we adults can process the time change and stay in bed until our normal wake-up time even after we “fall back”, your baby or young toddler can’t do this. You can bet that if your baby usually wakes at a certain time (say, 6:30 a.m.), she’ll wake about an hour earlier than normal after the time change (closer to 5:30 a.m., in this case). That’s due to the fact that 5:30 feels like 6:30 to your child – because it WAS 6:30 just a day ago! This is the main reason why “falling back” causes so many problems for parents, and why we hear about it often in our Helpdesk each fall. The end of daylight saving time causes most children to wake earlier than usual, and that in turn throws off naps and bedtime, and this turns into a relentless cycle of overtired crankiness from which it can feel very difficult to escape. …then it may be just fine to do nothing at all. Your baby will probably have a few “off” days, sleep-wise, after the time change, but since he’s adaptable, he’ll likely adjust without issue. …then you’ll probably want to adjust the schedule ahead of time, to minimize damage. If you don’t, your baby will probably wake too early, and may have a hard time getting back to normal. What’s more, since your baby is less-than-perfectly-adaptable, the schedule disruptions may cause big nighttime and nap time waking problems, which you no doubt want to avoid. To prevent the time change from destroying your family’s sleep, you can work to gradually adjust your baby’s schedule forward by degrees, until she’s close to waking about an hour later than usual. Move the schedule (wake-up, naps, and bedtime) forward by 10-15 minutes every day or two. For example, if your baby usually wakes at 6 a.m., and you’d like to keep it that way, work towards having her get up closer to 7 a.m. (and shift everything else ahead, too); that way, after the time change, she’ll be waking around 6 again and everything else in her schedule should adjust accordingly as well. Making this shift gradually, by degrees, works well for most unadaptable babies, but some parents prefer to ‘split the difference’ to avoid having any schedule drama, like crankiness or overtiredness. To split the difference, you would work towards shifting the schedule back by 30 minutes; then, after the time change is over, she’ll probably be waking about 30 minutes too early, but since this is a small problem, it’ll be easy to get back to your normal time without issue. For example, if you want to split the difference, and your child is usually up at 6 a.m., shift everything ahead so that she’s waking at 6:30 a.m. After the time change, she’ll probably wake at 5:30 a.m., but you can spend a week or so working towards a 6 a.m. wake-up call again. ….congratulations! You don’t have to do anything. The time change will effectively bump your child’s schedule back by an entire hour, so this should solve any late-waking problems you may be having. …..I’m sorry. 🙁 The time change isn’t going to do you any favors. And let me emphasize that in this case, you definitely don’t want to simply do nothing, as your baby is going to wake close to an hour earlier than usual after the time change. So if your baby is normally up at 5 a.m., you can expect a closer-to-4 a.m. wake-up call. Yikes! Not to worry, though – you can take steps to minimize the damage. Here’s what we recommend: begin shifting your child’s schedule forward by degrees in the days leading up to the time change, using the same process outlined earlier. If your child is waking at 5 a.m. for example, and you want him to wake at 6 a.m., work towards a 6 a.m. start to the day, and shift everything else forward by an hour, too. After the time change, you’ll be back to a 5 a.m.(ish) wake-up time. From there, you simply work again towards a 6 a.m. start to the day, once the time change is done. This might sound like a ton of work, but in our experience, it’s so much more palatable than not doing anything and having your baby wake way, way too early instead of just early. The end of Daylight Saving Time is right around the corner – we’ll be “falling back” before we know it! If you’re too tired or overwhelmed to do a bunch of reading and to create your own DST prep plan, let us do the work for you. You can connect with one of our caring, expert sleep consultants today, and she’ll send you your very own Personalized Sleep Plan™ that will walk you through every step of DST prep. It will also outline the steps you need to follow to improve your baby or toddler’s overall sleeping habits. Or, join our Members Area packed with exclusive content and resources: e-Books, assessments, detailed case studies, expert advice, peer support, and more. It actually costs less to join than buying products separately! Even better – as a member, you have access to our #1 Daylight Saving preparation resource, our Shift Your Child’s Schedule e-book. This e-book is the perfect tool for helping you gently shift your child’s schedule in order to accommodate the time change – and members can download and print a copy of the book! And don’t forget that as a member, you’ll also enjoy a weekly chat with an expert sleep consultant, which is perfect if you have truly tough, pressing DST questions that require expert help. And the best part – members receive 20% off all sleep consultation services! How are you planning for the end of Daylight Saving Time? How do you anticipate it will affect your baby or toddler’s schedule? Let’s put our heads together and share some tips and advice! How do I shift my 19 week old’s schedule? We’re still doing naps based on awake time and we don’t have a solid schedule in place yet. He still only gives me 30-40 minute naps although sleeps 11-12 hours at night. Even when we push bedtime by 15 minutes he still wakes at the same time in the morning (6:15 ish). How can I move the wake up time accordingly??? @Gessica, Thank you for your comment. I’m sorry to hear that your son is still having short naps, but it is great that he is sleeping so well at night! Shifting his schedule can be difficult to accomplish, but it can be done! Naps are a very important part of early waking. I recommend reading this article which pertains to your exact situation. It has links throughout the article about how to get your baby on a good schedule, specifically in preparation for the end of Daylight Savings. 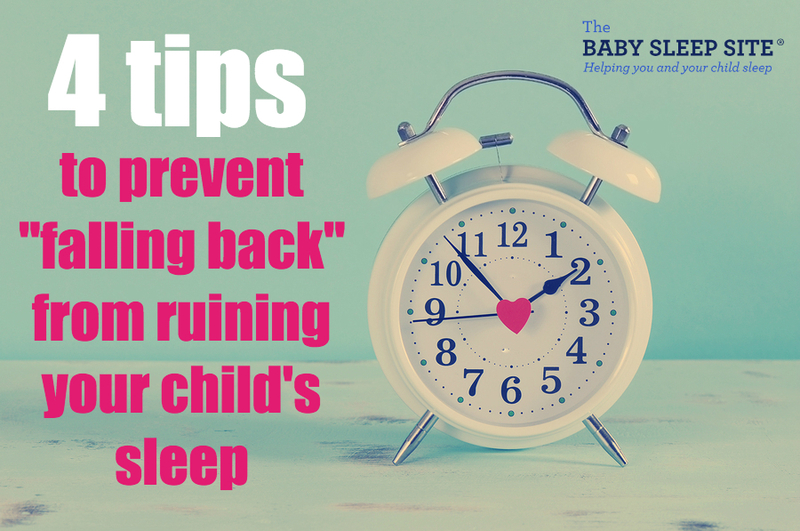 Here is a link to the article: https://www.babysleepsite.com/tag/adjusting-schedules/ And, if you find that you would like more help, we have a great ebook just for shifting schedules. You can read more about the ebook here: https://www.babysleepsite.com/baby-waking-too-early/ Best of luck to you and your family! Thank you Emily for the feedback. As far as sleep, my 5-month-old had been a great sleeper until about 2-weeks ago. I do believe we have hit a sleep regression– he is currently up twice a night to eat. Riding the wave and hoping it ends soon. I still put him down awake in his crib which is not a problem, but he does wake every 3 hours during the night for the past 2-3 weeks. Good luck, Marissa, and thanks for commenting! My daughter wakes up between 6-7:30am. She’s 7 months. She goes to bed early (between 5:45-6pm). How do I approach the time change since she has such an early bedtime? After time change she’ll be going to bed at 4:45pm! Too early. Do I start shifting her morning 9am nap by 15 minutes every day? Also, she doesn’t adjust well. She’s a great sleeper but not very adaptable. I have a feeling it may take awhile. When do you recommend I start? @ Tara – I’d definitely move your child’s bedtime forward (5:45 is pretty early, unless she’s a newborn or very young infant). That would be a great first step. You can gradually push naptimes back as well, and then see what that does to the morning wake-up time. Our 18 month old has always been an early riser. The last month or so she has finally been sleeping in until 6-6:30 because we were keeping her up a bit later. She is in bed anywhere from 6:30 if really cranky to 7:30). She is in daycare 3 days a week. But this past week she has been getting up between 5-6am again 🙁 Mommy is TIRED! What do you suggest for us? @ Mikhala – hope your plan arrives soon and that you can get to work! Based on what you describe, you’d probably want to start at least a week before the time change w/ the schedule shifting, and push everything back gradually until it’s happening an hour later than usual. However, if your little one already has some sleep issues (like early waking), then tread carefully; you could definitely talk to your consultant about how to approach DST prep once you have your plan in hand. Great article! I find it hard to adjust to daylight savings as an adult too. @ Kristin – hah, me too! Although I find “springing forward” WAY harder as an adult than “falling back”. I actually like the end of DST now that my kids are older and can be counted on to sleep in. But I remember well the days of having a baby at home, and just dreading the time change! @ Anastasia – great question! Yes, it does – you’ll want to shift everything forward gradually so that when we “fall back”, everything shifts backwards by an hour, back to a more normal time. Does adjusting the schedule gradually mean pushing their bedtime back gradually as well?